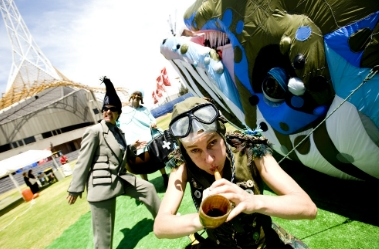 For two days only, Born in a Taxi are bringing the incredible show, The Whale’s Tale, to Melbourne Zoo to celebrate World Whale Day. This interactive and highly entertaining show follows the story of Manilayo, the whale who is curiously beached at Melbourne Zoo’s Main Lawn and discovered by a child. Immerse yourself as you watch from the shore or submerge yourself in this underwater playground full of surprises and become a part of this large outdoor performance. Come along to learn about the importance of a clean marine environment and make the pledge to blow bubbles and not balloons for Zoos Victoria’s When Balloons Fly, Seabirds Die campaign.